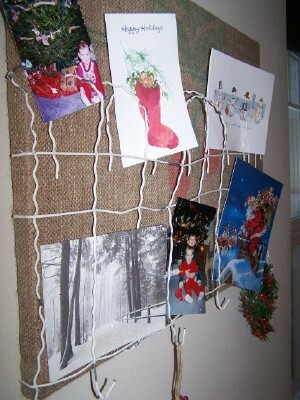 On the eleventh day of Christmas Beyond The Picket Fence showed me... a Christmas card holder that is nifty! Are you as ready as I am for the poor rhymes to be over? 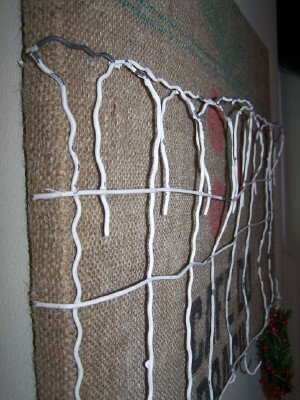 For this quick project I used a coffee sack. 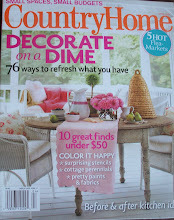 I chose one with a little green and red on it, but you also could use fabric, an old tablecloth, burlap you have stenciled. I staple gunned it to the wood frame of a garage sale bulletin board (never pass on bulletin boards). I then added some garden fencing to the front, bending it around the edges to secure it. 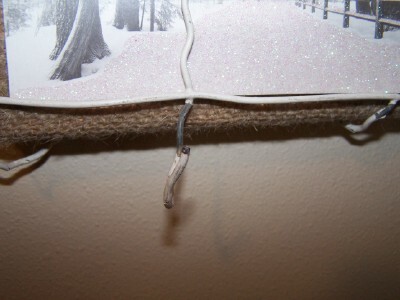 I curled up every other wire on the bottom for a hook (and yes, this too could hold stocking). 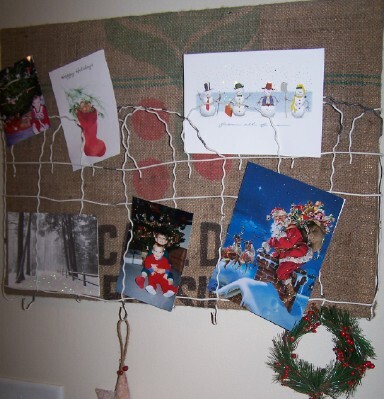 And voila--Christmas card holder that can be used long after Christmas is over as a message center. Oh so cute. You are so creative. How do you get all of this done during such a busy time of year???? 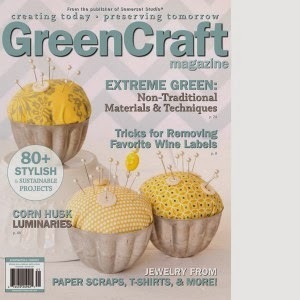 That's neat -- I'd love to make one to use as an inspiration board. I Really, Really like that idea! and I have all the materials! Yeah! Thanks for Sharing! Cute idea, seems like you could use wire hangers if you didn't have garden fencing. Thanks for the inspiration! Really creative. I love that the stockings could hang from it also. Such a neat idea. Everyone is always looking for a creative way to display their cards. This surely qualifies as creative. Good job. BTW I am your newest follower and I plan to link up to your party tomorrow. Hi Becky, This is too cute!! I have bits of this fencing I hoarded waiting for a project! 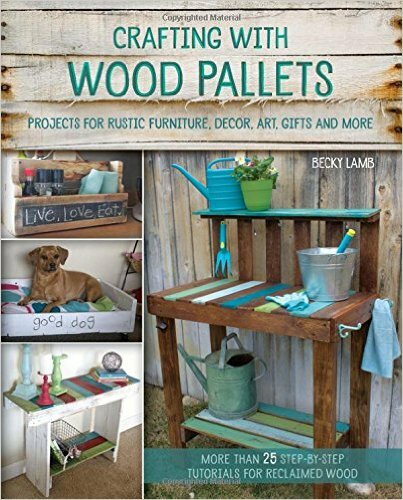 This will be the perfect board for the garden shed! Thanks for the inspiration!! LOVE IT!! What a great use for that fencing! Thanks for stopping by and linking up to Thrilling Thursday @ Paisley Passions :) Hope you stop by again soon!